Grasslands Meat Market in Anaheim GardenWalk is celebrating its one-year anniversary with exciting specials and giveaways just in time for summer - the official season for backyard barbecues, Fourth of July parties and seasonal grilling. 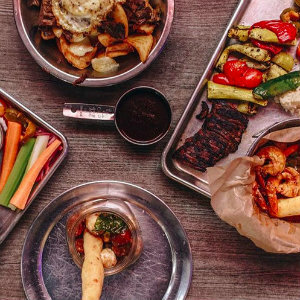 The summer-long celebration will include featured barbecue platter deals along with a limited-time BBQ Box offer, complete with all the essentials for hosting a backyard event of your own. Get your fix with Grasslands signature BBQ platter, brimming with a delicious selection of meats and choice of sides. With the purchase, guests will receive a complimentary side of the grass-fed and grass-finished house favorite, Picanha, a rare and flavorful cut of Brazilian sirloin cap that’s rubbed with sea salt, roasted and thinly sliced. To spice up the deal, guests will also receive their very own Grasslands signature seasoning to use at home. Continuing the celebration through Labor Day weekend, guests can now purchase The BBQ Box, while supplies last. The BBQ Box feeds 6-8 people and features 10 plus pounds of meat, including the signature house meat, Picanha, along with two racks of St. Louis ribs, one rack of beef ribs, one whole chicken, mashed potatoes, black beans and a fresh green salad with choice of dressing. The BBQ Box can be purchased for $99. Grasslands Meat Market is dedicated to serving top quality, globally and ethically-sourced meats. Focused on the art and science of meat preparation, Grasslands prides itself on distinctive flavor profiles and unique offerings. Open 4-10 p.m. Sunday through Thursday; 4 p.m. to midnight Friday and Saturday. Free parking available at GardenWalk for the first hour, validation provided for the second hour.